Conducting ITTF/PTT Level One Courses in 2017, Lincon Yasuda journeyed here there and everywhere in his native Brazil. He visited Joinville in the state of Santa Caterina, he travelled to Rio de Janeiro and Brasilia in addition to Belo Horizonte in Minais Gerais and Campo Grande in Mato Grosso do Sul. The latest stop was Porto Alegre, the capital city of Rio Grande do Sul, the most southerly state in the country, it borders both Argentina and Uruguay. Now in 2018, the travels start again; from Monday 4th to Friday 8th June, the destination was Fortaleza, the city from which Thiago Monteiro hails and very much in the north east of the country, just below the Equator. Travelling from Porto Alegre to Fortaleza is a flight of some 2,000 miles, or by road over 2,600 miles; drive at an average speed of 50 miles an hour and it will take you something like two and a half days! Venue for the proceedings was the Olympic Training Centre in addition to the Athletic Association Bank of Brazil; a total of 17 students attended the course of whom 10 were men and seven women. Most members of the group were physical education teachers, students from the local area or practising coaches. A special feature of the course is that it is linked to a most ambitious project: “Tênis de Mesa – Novos Talentos”. Basically, it is the search for new talent and is the brainchild of the ambitious and most enthusiastic Mauro Benavides Neto. The target is the introduce table tennis to 800 students in 10 local government controlled schools. Fortaleza is in the state of Ceará. 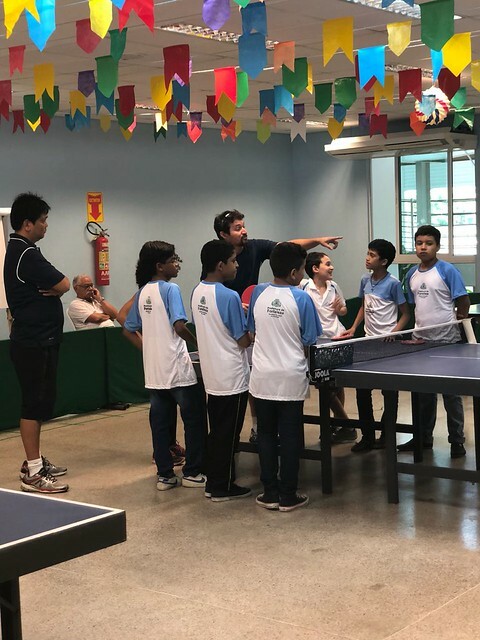 The project operates in conjunction with the state’s table tennis association (Federação de Mesatenistas do Ceará) under the Presidency of Valberto Almeida and the local government offices (Governo do Estado do Ceará), as well as in conjunction with the Fortaleza Ministry of Education (Secretaria Municipal de Educação). The project is sponsored by ENEL, a major energy company.